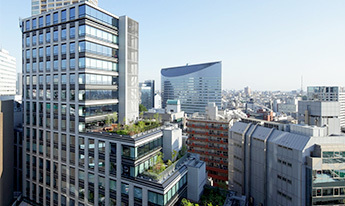 The Tokyu Fudosan Holdings Group recognizes that climate change is an important environmental issue that greatly impacts its business activities. In 2014, the Intergovernmental Panel on Climate Change (IPCC) released the Fifth Assessment Report (AR5). This report found that warming of the climate system is unequivocal and it is extremely likely that human influence has been the dominant cause of the observed warming since the mid-20th century. Climate change caused by global warming not only causes rising sea levels, but also abnormal weather such as an increase in heavy rains and flooding as well as droughts. The businesses of the Group are not only directly affected by weather conditions, such as snowfall amounts required to operate ski areas, but also indirectly affected as well such as the fact that the worldwide procurement of various supplies required for our businesses may become difficult. 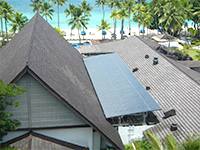 It is based on this awareness that the Group is promoting the more efficient use of energy and the utilization of renewable energy at its business offices as well as the office buildings, commercial facilities and resorts that it owns in an effort to mitigate the impacts that its business activities have on climate change. 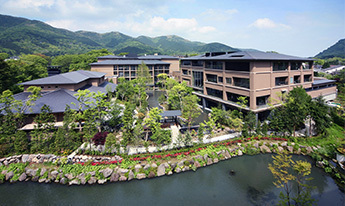 The development and operation of energy efficient office buildings, commercial facilities and resorts will create business opportunities and enhance the competitiveness of the Group. We will continue to work with design firms, construction companies, end users and other stakeholders in an effort to realize a low-carbon society and address the issues of climate change and energy consumption. The Tokyu Fudosan Holdings Group has in place the Tokyu Fudosan Holdings CSR Promotion Committee, which is chaired by the President & Representative Director of Tokyu Fudosan Holdings and co-chaired by the Director in Charge of CSR of Tokyu Fudosan Holdings, and whose members include directors in charge of CSR from Tokyu Fudosan Holdings’ subsidiaries. The committee meets regularly twice a year to discuss, plan and confirm results pertaining to material issues, such as compliance, climate change, social contributions, and diversity. In turn, the results of committee deliberations are reported to the Board of Directors, which is led by the President & Representative Director of Tokyu Fudosan Holdings. 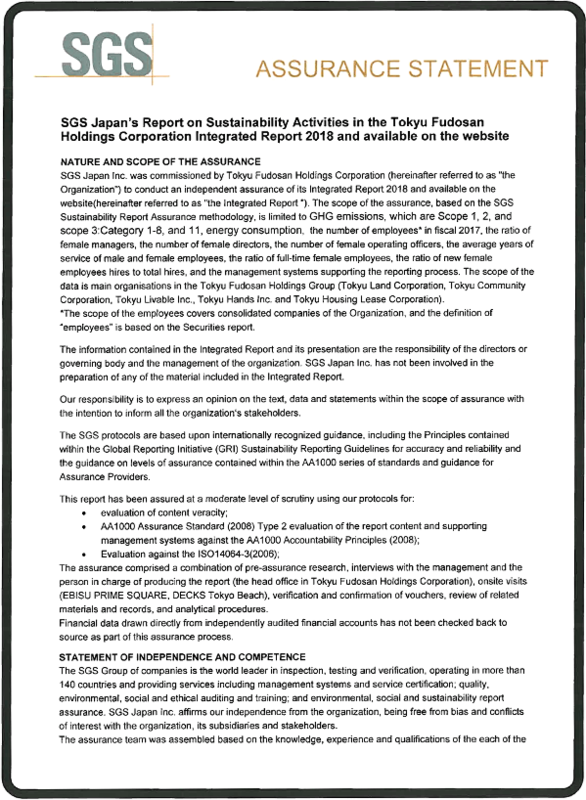 Additionally, the Environment/Social Contribution Council, established as a subcommittee to the Tokyu Fudosan Holdings Group CSR Promotion Committee, leads relevant management activities across the entire Group. The Environment/Social Contribution Council, comprised of environmental managers from each group company, sets group-wide fiscal year targets for greenhouse gas emissions, a major cause of climate change, monitors results and shares information based on a shared policy. This ensures proper reporting under relevant laws and regulations and environmental impacts are reduced through business activities. 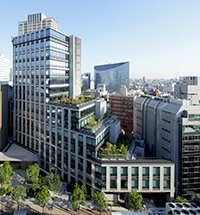 In fiscal 2017, the Tokyu Fudosan Holdings Group launched the 2017-2020 Management Plan as stage 2 of its Value Frontier 2020 medium-and long-term management plan. One of the materialities that form the basis for its formulation is the "change in the natural environment". Among them, we regard "climate change" as medium to long-term risk. ・With advanced renewable energy sources and technologies including energy management system becoming available, Tokyu Land Corporation has always been on the lookout for latest trends and technologies to identify and seize business opportunities that climate change presents. 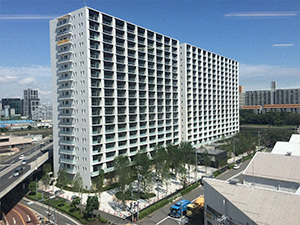 One such example is BRANZ City Shinagawa Katsushima, the first condominium in the world with each unit equipped with ENE-FARM, a fuel cell system developed specifically for multi-family residential. Also successfully completed in FY2017 are two multi-family residential projects, one with 11kW-solar power generation system and the other with EV sharing. We are now looking to offer residential with smart home services using cutting-edge energy management system and IoT technology. ・The Energy Conservation Act has been strengthened in recent years and we adhere to the stricter requirements as part of our climate-change risk management. Under the amended Act, we are required to make an effort to reduce annual emissions from our properties including office buildings, commercial facilities, resort facilities and fitness facilities by average of 1%. 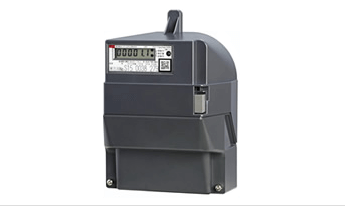 We renew and renovate our facilities and run routine energy management and energy conservation activities in order to meet the reduction target and other requirements. Worsening natural disasters while transition to low carbon/renewable energy stalled. Natural disasters becomes not as worse as 4℃ scenario while ZEB/renewable energy become popular. Tokyu Fudosan Holdings Corporation has agreed to the recommendations of “Task Force on Climate-related Financial Disclosures(TCFD)” established by the Financial Stability Board (FSB). 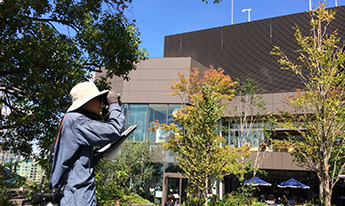 As a member of the environmental committee of "The Real Estate Companies Association of Japan ”, Tokyu Land corporation is working on promoting environmental action in the real estate industry. The committee periodically collects excellent efforts by member companies that lead to reduction of environmental burden and sustainable society building . 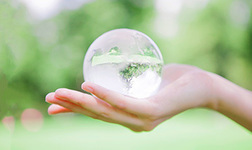 They are used to share information among member companies and to further improve environmental awareness. Furthermore, we actively make proposals to public policies and regulations through “Low Carbon Town Planning Action Plan” or ” Environmental voluntary action plan”etc. • Decrease in revenue due to unexpected weather conditions including intense rainfalls and typhoons leading to fewer operating days. • Added restoration cost related to collapsed slopes in the resort facilities caused by unexpected torrential rain. • Decrease in revenue generated from our ski resorts and other winter sports facilities due to shorter operating period caused by warmer temperature and less snowfall amid global warming. 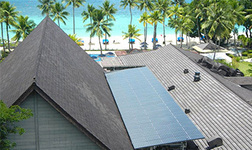 In order to reduce exposure to GHG emissions and therefore less sensitivity to changes in cost of carbon, we have been advancing our research of and exploring further deployment of renewable energy generation facilities including solar and wind power generations to our commercial and resort facilities. The Group supports and respects the UN Global Compact. 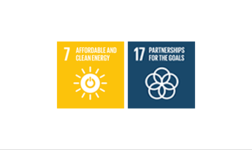 In accordance with the 10 principles of the UN Global Compact broken down by the subjects of human rights, labour, environment, and anti-corruption, we are promoting responsible management aimed at contributing to the realization of a sustainable society. Tokyu Land Corporation has established process targets for the development projects it is involved in based on the format of these projects. For example, development projects involving new build condominiums must comply with Insulation Performance Level 4 within the Evaluation Methods and Standards based on the Housing Quality Assurance Act. Also, Tokyu Plaza Ginza, a large-scale commercial facility, will be developed with the same level of performance as quasi-top level place of business recognized for outstanding countermeasures taken against global warming by the Tokyo Metropolitan Government. This card shows data on CO2 emissions of Tokyu Fudosan Holdings Group. ・Scope 1・2 cover the scope of Tokyu Fudosan Holdings and five operating companies. 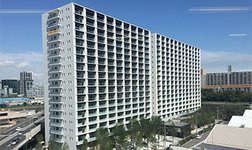 ・Category 1･2･6～8 cover the scope of Tokyu Fudosan Holdings and consolidated subsidiaries. Category 3･5 cover the scope of Tokyu Fudosan Holdings and five operating companies. Category 4 covers the scope of Tokyu Fudosan Holdings and Tokyu Land Corporation. Category 7 was calculated based on the number of employees stated in the securities report. Category 8 started calculation in FY 2016. Category 10, 14, 15 are not applicable. Category 11 covers the scope of Tokyu Land Corporation. Category 11 is not calculated because it is difficult to grasp energy other than electricity used by residents. 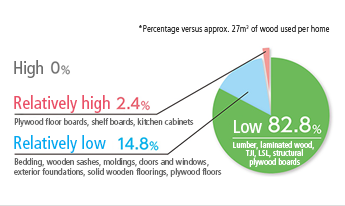 Category 12 is not calculated because it is difficult to grasp data. Category 13 is included in scope 1･2. 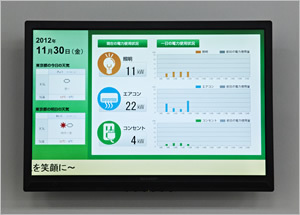 This card shows data on energy use of Tokyu Fudosan Holdings Group. This card shows data onGHG( CO2) emissions and energy consumption of Tokyu Fudosan Holdings Group. 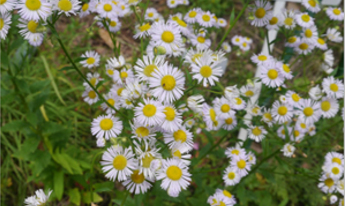 ・As greenhouse gases other than CO2 are extremely small amounts, CO2 emissions are regarded as greenhouse gas emissions. Amid calls to reduce emissions of CO2 and other greenhouse gases in the supply of energy, expectations are rising for renewable energy from solar and wind power. Renewable energy is not depleted with use because it is produced from natural phenomena. It also does not emit greenhouse gases. The renewable energy business, in addition to producing clean energy, contributes to local job creation and economic activity through the development and operation of power generation facilities. The Group ﬁrst invested in a solar power generation project in 2014. In 2017, we entered into a capital and business alliance with Renewable Japan Co., Ltd., a renewable energy provider. In July 2018, through a joint investment with the Development Bank of Japan we began an ownership and operation business for seven projects that are either currently in operation or under development. With this investment, we are now involved in renewable energy business facilities in 32 locations throughout Japan (including projects under development). 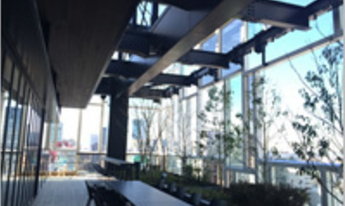 The Group works to reduce CO2 emissions in the office buildings it manages through the installation of energy-saving equipment and in cooperation with its tenants. 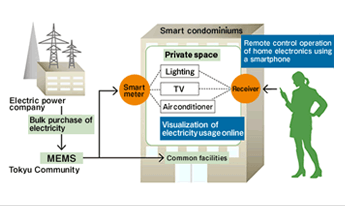 By implementing these initiatives, the Group aims to serve a pioneering role in achieving the numerical energy conservation targets for new office buildings stipulated in the environmental action plan formulated by the Real Estate Companies Association of Japan. At the Shin-Meguro Tokyu Building developed by Tokyu Land Corporation, we have achieved visualization through the installation of BEMS (building energy management system) monitors on each floor that allow tenants to confirm their energy consumption and also reduced energy use for the entire building through means such as the installation of natural ventilation systems and automatic dimming equipment. The 356-unit Branz City Shinagawa Katsushima is a large condominium building in which the collective strengths of the Tokyu Group, including Tokyu Land Corporation and Tokyu Community Corporation, are being used to make it more energy efficient. 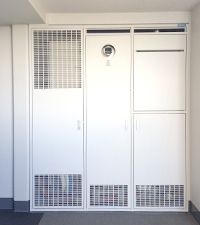 As a result of efforts including the adoption of the world's first home use fuel cell for condominiums called Enefarm in all housing units and the installation of HEMS as a system the enables the visualization of home power consumption, it has been estimated that CO2 emissions have been reduced by at least 60% and the highest S Rank (self-evaluation) has been acquired using CASBEE (Comprehensive Assessment System for Built Environment Efficiency). 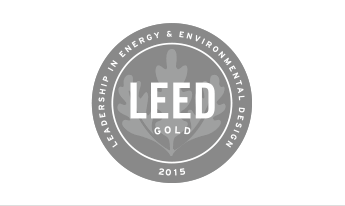 We will verify CO2 reduction results and provide feedback to residents as we aim for even further energy efficiency. In recognition of these efforts, the project was selected as a Low-CO2 Residence and Building Leadership Project by the Ministry of Land, Infrastructure and Transport. 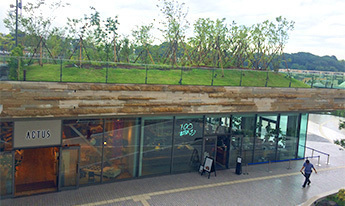 The Group uses photovoltaic energy, wind power and other forms of natural energy to power various businesses. Solar power generation systems have been introduced to resort facilities, specifically to the Palau Pacific Resort and Tokyu Harvest Club Atami Izusan & VIALA. 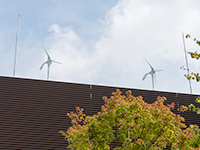 In addition, at the commercial facility Tokyu Plaza Omotesando Harajuku, two wind turbines have been installed on the rooftop to foster the use of natural energy. Tokyu Land Corporation approves the Tokyo Cap-and Trade program. 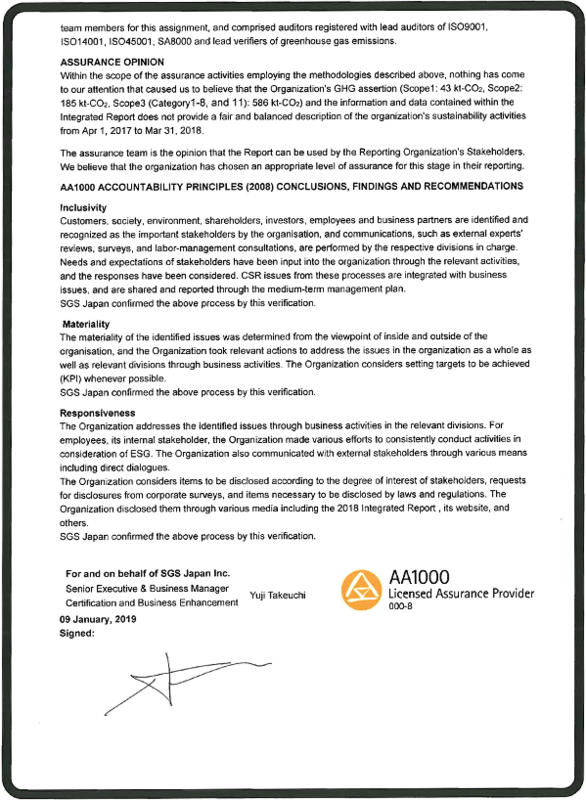 The Tokyu Fudosan Holdings Group receives independent verification of its environmental data from a third-party in order to ensure the reliability of this information. For fiscal 2018, the scope of this verification includes data for our greenhouse gas emissions (Scope 1, Scope 2, Scope 3 (Category 1-8 and 11) and energy consumption).